The nose is a crucial factor for the appearance of the face. Correcting an unaesthetically formed nose can result in a considerable beautification of the face and harmonisation of the overall aesthetic impression. The aesthetic shape correction of the nose is considered the most difficult procedure in aesthetic surgery. Only very few plastic surgeons possess a specialised education for this procedure and look back on long-termed experience. At DERMATOLOGIKUM BERLIN, Dr. Rupprecht is available as one of Germany’s most experienced nose surgeons. Dr. Rupprecht has conducted more than 2000 nose surgeries with functional and aesthetic indications. He built up his remarkable expertise over a period exceeding 15 years. That is why Dr. Rupprecht is regularly called in by other plastic surgeons to consult on nose procedures. 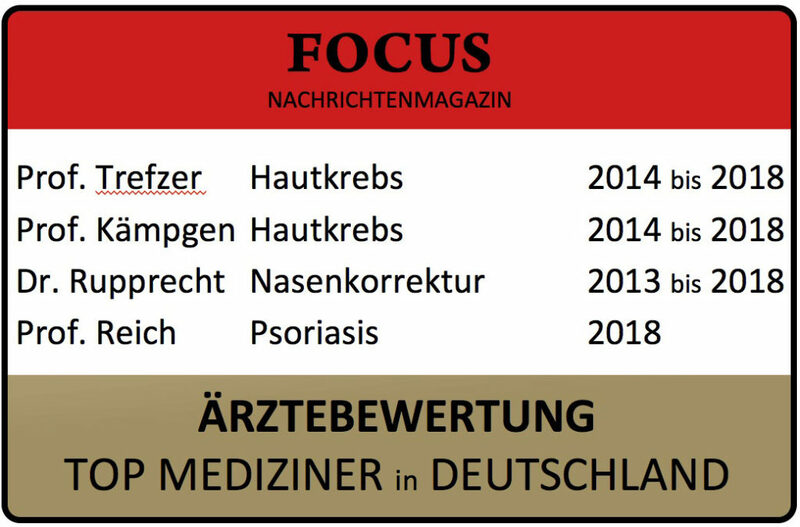 He has been honoured one of the top physicians in Germany by being mentioned on independent physicians’ directories in the field of nose surgery (Bunte, FOCUS) multiple times, including the well-known FOCUS physicians directory of the best nose surgeons (see “News”) in the years 2013-2017 without interruption. Dr. Rupprecht has particularly comprehensive experience with revision surgeries, i.e. rhinoplasties for noses that had been (unsuccessfully) operated on by other doctors. Of his more than 2000 nose procedures, such corrective surgeries constitute a considerable amount (exceeding 40%). He is proficient in all modern techniques for the treatment of even the most complex indications (extracorporeal rhinoplasty of the nasal septum, reconstruction of the nasal framework with ear and rib cartilage, build-up of the nose’s bridge using diced cartilage etc.). Dr. Rupprecht has given more than 100 talks on nose surgery issues at national and international conferences and surgery classes. During his numerous work shadowings in the USA, he networked with colleagues for scientific exchange, for example with Dr. Rolling Daniel in Newport Beach, USA. Dr. Rupprecht is a founding member of the Rhinoplasty Society of Europe and a full member of both the American Rhinoplasty Society and the European Academy for Facial Plastic Surgery (EAFPS) (see Dr. Rupprecht under “Doctors & Team”). There are various surgical techniques available for the aesthetic & functional correction of the nose. Which technique is suitable for each individual patient can only be determined through a personal presentation of the patient at the practice. During the presentation, the nose is being examined from the out- and inside. The latter is of special significance because the nose’s function must be considered when operating on it. In some cases, an impairment of the nasal breathing is the main cause for surgery. Dr. Rupprecht has operated on hundreds of noses with both aesthetic and functional indication and can therefore consider both aspects optimally. To fine-tune the desired nose shape with the patient, a computer can simulate the aesthetic nose correction. Aesthetic & functional nose operations are usually performed under general anaesthesia. They can take place either as outpatient treatment at DERMATOLOGIKUM BERLIN or as inpatient treatment at a nearby private clinic where the patient can spend one or more nights after the surgery. With Medipay patient payment, you can pay your treatment costs conveniently and at low interest in monthly instalments. Click here for more information. Closed every last Saturday of the month.